That question is most often answered by a big, resounding “SECRET”. You are afraid that you are earning MORE THAN the person who asked. You are afraid that you are earning LESS THAN the person who asked. In the Philippines, Sweldo is the Tagalog Term for Sweldo. And same with the others around the world, Sweldo can shape you in terms of hierarchy, spending power, status, social life and many many more. The average number of hours one spent in an office is 8 hours. The minimum wage is currently 450pesos a day. The type of works that have the highest income are in the fields of BPO, Information Technology, Science and Engineering. The contributions that you will be deducted upon the sweldo day mostly includes SSS, (GSIS ofr Government Workers), Philhealth, PAGIBIG among others. Most employees get paid bimonthly every 15th and 30th. Payments are either made via Payroll account (just like me) while others do direct payments. A “paycheck” is given that shows your rate and the other specifications of why you get that amount for that said pay day. Your income depends on the days you report to work and on the time you spend at work. Most starting salary for fresh graduates is 13,000 but still depends on the field you are in. In the Philippines, white-collar jobs receives higher payment rather than blue-collar jobs. White-collar jobs are those that includes the mental strength in the work like offices while blue-collar jobs are works that includes the physical strength. WHERE DOES YOUR SWELDO GO?! Your sweldo goes in a two-way system. Either you spend them or you keep them. Every time an amount goes out of your sweldo that's spending. Items that you spend are also known as expenses. Now if you keep the money that's also another term for saving. Most sweldo goes to the necessity like food, transportation, bills and so on. A portion of the population do save some amount for the future while a tiny portion invest. Of course a sweldo well-spent keeps a person financially healthy. Below are some do's and don'ts you might want to remember. Do study your paycheck. Know what's happening to your monthly income. How much your taxes are and how much goes to the contributions. Do keep a budget. A budget gives you a template to rule how your money will go in a day, a week or a month. It is a must have for those who receive a sweldo. Don't spend without securing a savings. Make sure you follow the golden formula of Income-Savings=Expenses. Do spend intelligently. Be a Smart Shopper and avoid to be tempted. There are far more better ways to use your money. Don't let your income define who you are as an employee. Just do your work and the salary increase will happen. Read: 8 Tips to Have a Major Major Salary Increase. Don’t settle for just one source of income. Try to find a hobby or skill that can boost your savings account. 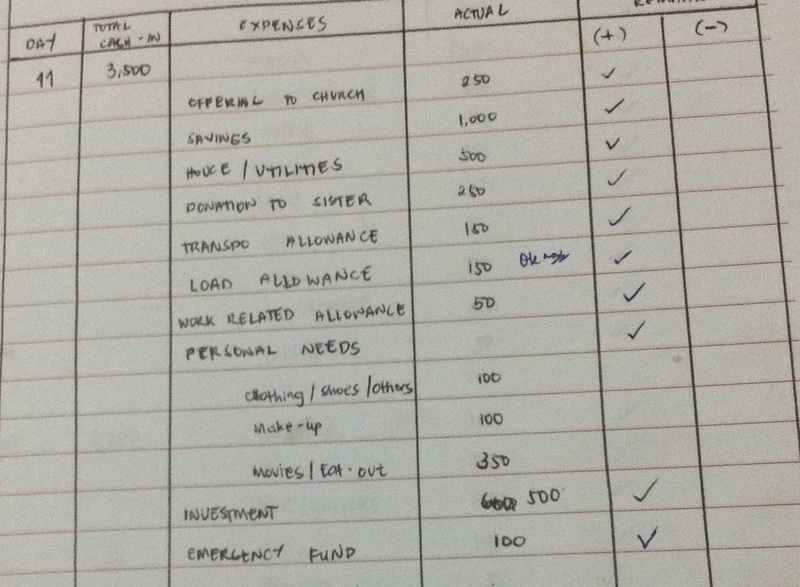 I shared my personal notes in the blog post titled How To Earn Extra Income in the Philippines. Do give back. Tithe, help your family and devote yourself to worthy things. Money is not just everything. You need your friends, your health and your happiness. My Dad once told me, “Ang masarap na sweldo yung sakto lang sa talent o skills mo”. You have to understand that in THE REAL WORLD you will get solely the amount equals your performance and from what the standards of your boss are. Don’t expect too much of your company. Don’t expect that all your hard work, late night sleep and amazing efforts will pay off. Do your job. Be present. And one day you’ll reap the harvest. BELIEVE ME. I do hope you enjoyed today's post. This is 3rd from my All About installment. You may read All About Paluwagan and All About Five-Six too! What’s your comment for today’s post?! I’d love to hear from you!